Abstract: The Black Death visited unprecedented mortality rates on Europe, realigning relative values of factors of production, and in consequence the costs and benefits of defining and enforcing property rights. Our model refines the conceptual range of shared claims that exist between open access and private property, improving analysis of the postplague pattern and timing of abandonments and privatizations. Because of title enforcement costs, the decreased marginal value of nonhuman assets induced a lapse of some private claims, although communities continued to exploit a part of those resources informally as a commons. In contrast, the marginal value of labor and human capital rose, which placed insupportable stress on feudal institutions. The predictable evolution of workers� rights to their own labor accelerated the erosion of serfdom. The Black Death thus illustrates demographic change inducing evolutionary institutional change. The Black death of 1348 caused a massive upheaval in European society. Towns and villages were left without rulers and effective police. Fields lay fallow for want of workers. There was no understanding of the causes of illness, and no intellectual or philosophic framework for dealing with any aspect of life other than religion. Accordingly, the plague could be viewed as punishment for sins, or blamed on lepers or Jews. The Black Death rendered the forces of law and order helpless. As it did not occur to the Jews to undertake their own self-defense, the results of the pogroms of this period were especially catastrophic. "See, I give you a little package, half a span in size, which contains a preparation of poison on venom in a narrow, stitched leathern bag. This you are to distribute among the wells, the cisterns, and the springs about Venice and the other places where you go, in order to poison the people who use the water. ..."
On Oct. 3, 1348, during the summing up of a trial, an allegation providing a motive for the total destruction of Jewry was made; it was asserted that "before their end they said on their Law that it is true that all Jews, from the age of seven, cannot excuse themselves of this (crime), since all of them in their totality were cognizant and are guilty of the above actions:"
("asseruerunt praefati Judaei ante eorum ultimum supplicium per legem suam esse vera dicentes quod omnes Judaei a septem annis circum non possint super hoc se excusare, quoniam universaliter sciant omnes, et sint culpabiles in dicto facto"). "If you are not afraid of poisoning, why have you yourselves covered and guarded your wells?" 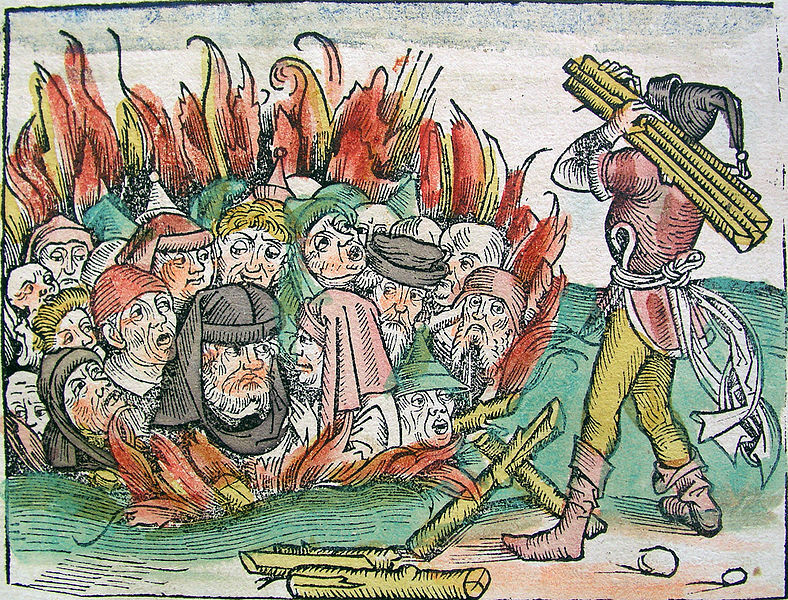 The defamation, killings, and expulsions spread throughout Christian Spain, France, and Germany, to Poland-Lithuania, affecting about 300 Jewish communities. On September 26, 1348, Pope Clement VI issued a bull in Avignon, Quamvis Perfidiam, denouncing this allegation, stating that "certain Christians, seduced by that liar, the devil, are imputing the pestilence to poisoning by Jews." This imputation and the massacre of Jews in consequence were described by the Pope as "a horrible thing". 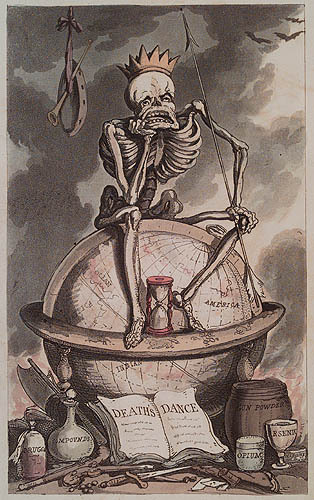 He tried to convince Christians that "since this pestilence is all but universal everywhere, and by a mysterious decree of God has afflicted, and continues to afflict, both Jews and many other nations throughout the diverse regions of the earth to whom a common existence with Jews is unknown (the charge) that the Jews have provided the cause or the occasion for such a crime is without plausibility." "But I know that there were more Jews in Vienna than in any other German city familiar to me, and so many of them died of the plague that they were obliged to enlarge their cemetery. To have brought this on themselves would have been folly on their part." However, all these appeals to reason were ineffective. The massacres of the Jews continued, and Jewish property was confiscated. "Forgiveness is (granted) for every transgression involving the slaying and destruction of Jews which has been committed without the positive knowledge of the leading citizens, or in their ignorance, or in any other fashion whatsoever." By this time it was understood by nearly everyone that the accusation that Jews had spread the plague was false. The well poisoning libel was added to the repertoire of anti-Semitic lore. As with the Crusades, the aftermath of the black death massacres only increased the vehemence of anti-Semitism. Many Jews migrated to Poland and Lithuania, others remained in Central Europe and stubbornly rebuilt their communities. Resum�: I artiklen gennemg�s eksempler p� begivenhedsforl�bet i de j�deforf�lgelser, som fandt sted i det Tyske Rige i 1348-1349, ligesom pavens tvetydige holdning bliver analyseret. Stillet over for et aggressivt folkekrav havde magthaverne valget mellem at beskytte j�derne og derved risikere at miste deres legitimitet eller at bevare skinnet af deres autoritet ved at ombringe j�derne. Kun de st�rkest funderede fyrster og bystyrer var i stand til at fastholde den f�rste l�sning. The French historian and poet Jean Froissart (c.1333-c.1405) was educated for the church but at the age of nineteen began to write a history of the wars of his time. In 1360 he went to England, where he received a gracious welcome from Phillippa of Hainault, wife of Edward III, who appointed him clerk of her chamber. In 1364 he traveled in Scotland, where he was the guest of King David Bruce and of the Earl of Douglas. In 1366 he went to Aquitaine with the Black Prince; in 1368 he was in Italy, possibly with Chaucer and Petrarch, at the marriage of the Duke of Clarence. About 1390 he settled in Flanders, and resumed work on his Chronicle. In 1395 he revisited England, and was cordially welcomed by Richard II. He then returned to Chimay, where he had obtained a canonry, and where he may have died. Froissart's famous Chronicle deals with the period 1326-1400. Mainly occupied with the affairs of France, England, Scotland and Flanders, he supplies much valuable information about Germany, Italy and Spain. He is of all medieval chroniclers the most vivid and entertaining, accurate and impartial in his statements. 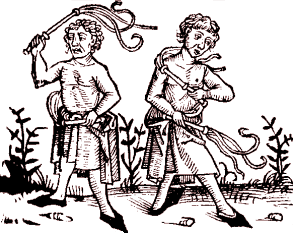 The following brief selection describes the flagellant [penitent] movement of 1349. In the Year of Grace 1349, the penitents went about, coming first out of Germany. They were men who did public penance and scourged themselves with whips of hard knotted leather with little iron spikes. Some made themselves bleed very badly between the shoulders and some foolish women had cloths ready to catch the blood and smear it on their eyes, saying that it was miraculous blood. While they were doing penance, they sang very mournful songs about the nativity and passion of Our Lord. The object of this penance was to entreat God to put a stop to the mortality, for in that time of death there was an epidemic of plague. People died suddenly and at least a third of all the people in the world died then. The penitents of whom I am speaking went in companies from town to town and from city to city and wore long felt hoods on their heads, each company with its own color. Their rules forbade them to sleep more than one night in each town and the length of their goings-out was fixed by the thirty-three and a half years which Jesus Christ spent on earth, as the Holy Scriptures tell us; each of their companies went about for thirty-three and a half days, and then they returned to the towns or castles from which they had come. They spent very little money on their journeys, because the good people of the towns which they visited asked them to dinner and supper. They slept only on straw, unless illness forced them to do otherwise. When they entered a house in which they were to dine or sup, they kneeled down humbly on the threshold and said three paternosters and three Ave Marias, and did the same when they left. Many reconciliations were achieved through the penitents as they went about, for instance, over killings which had taken place and about which it had so far been impossible to reach an accord; but by means of the penitents peace was made. Their rules contained some quite reasonable and acceptable things which agreed with such natural human inclinations as to journey about and do penance, but they did not enter the Kingdom of France because Pope Innocent, who was at Avignon at that time with his cardinals, considered the practice and opposed it very strongly, declaring in condemnation of the penitents that public penance inflicted by oneself was neither right nor lawful. They were excommunicated for doing it, and especially those clergy who went with them. A number of priests, canons and chaplains who supported them were deprived of their benefices. Any who wished for absolution had to go to Avignon to get it. So this movement was broken up and came to nothing when it was seen that the Pope and the King of France were against them, and they did not go beyond Hainault. If they had gone to Cambrai or Saint-Quentin, the gates would have been shut in their faces.